Our Asian friends now call Glasgow their home and Glasegians have welcomed the diversity their culture brings to the city. Their cuisine is just one of the many treasures we now share. Chinese restaurants were the first to throw open their doors to happy punters and many other Asian cousins have followed... Indonesian, Japanese, Korean, Malaysian, Singaporean, Thai and Vietnamese. I love Asian food and I know you'll love the growing list of tips we plan to reveal. Bar Soba lies hidden up a narrow lane off Buchanan Street, waiting to entertain with a generous list of cocktails and delicious Asian Fusion food. 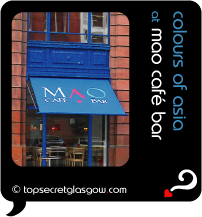 Cafe Mao serves up spicy Asian delicacies in a colourful, lively space. Enough chilli to kick without serious injury, and tables outdoors in summer. Great news! Finding this page means you can now join our VIP list for EAT Asian. Time to grab your very own page for EAT Asian. Do you have a special story about a time you decided to EAT Asian? A funny experience? A grand occasion? A funky photo? A personal tip? A top secret?